Cymbeline directed by Joseph Abuk and Derik Uya Alfred and performed by South Sudan Theatre Company, Globe to Globe, London, Wednesday 2nd May matinee. 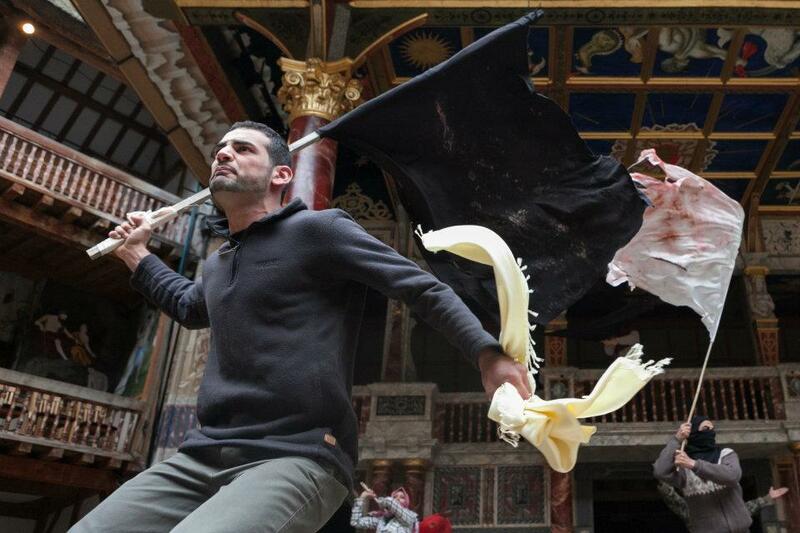 Romeo and Juliet in Baghdad directed by Monadhil Daood and performed by the Iraqi Theatre Company, RSC Swan, Stratford-upon-Avon, Friday 4th May evening. 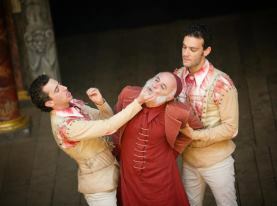 Richard II directed by Conall Morrison and performed by Ashtar Theatre, Globe to Globe, London, Saturday 5th May evening. These three Shakespeare appropriations deserve individual blog posts, of course, and I will be posting these in due course. However, because all three productions were taking part in the World Shakespeare Festival in one week, their combined effect has prompted me to think about what the word Arabic conjures up for me, how diversely Shakespeare can be appropriated, translated and presented, and how the World Shakespeare Festival is trading in/constructing images of the Arab speaking world for its audiences. The latter is not necessarily as ethically dubious as it sounds, and I will attempt to unpack why a little later, but it is important to note that at least two of these productions were commissioned by the festival organisers. 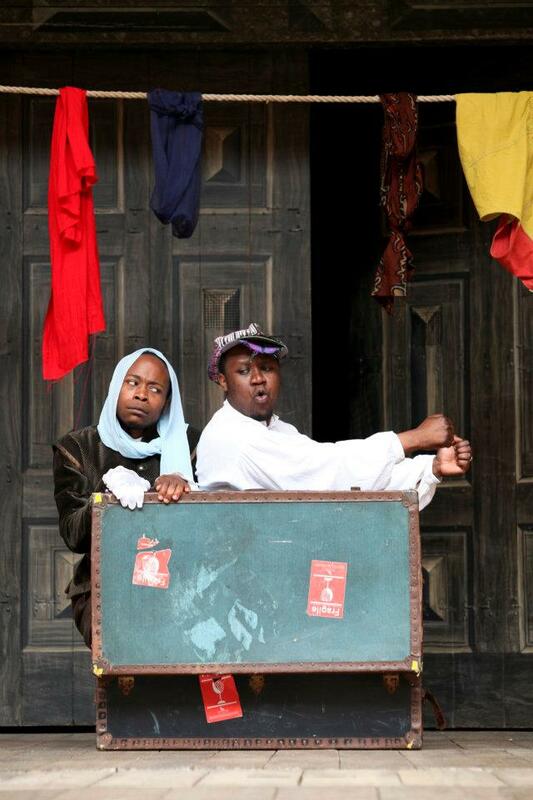 Cymbeline was translated into Juba Arabic by Abuk, and the play’s relocation to a Sudanese setting was a sharp reminder that Arabic is also an African language and has an existence outside of Middle Eastern and Muslim culture. The Guardian review explains that Juba Arabic is a colloquial form of Arabic spoken as a lingua franca between different tribes, and the Juba Cymbeline certainly sounded contemporary and informal to my untrained ear, the language matched by the dynamic, street theatre style of acting. 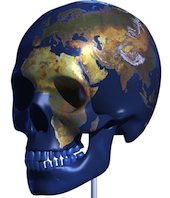 And like street theatre, mystery plays, and typical Globe productions, it played to and played with the audience. The production’s visual surface was a non-specific ‘tribal’ setting (perhaps an ancient kingdom, or perhaps a contemporary Sudanese village). Its dynamic action kept the non-Sudanese on board, but there were many jokes that only the Juba-Arabic speakers could get (see Margaret Litvin’s blog post on her attempt to follow the dialogue, which turned out to be very far removed from the Egyptian Arabic she can speak). A young Sudanese sitting next to me, there for the patriotism of the moment rather than the play, was texting on his mobile phone, but kept looking up and laughing when he heard the funny bits, his attention momentarily captured. Many others were captivated throughout. 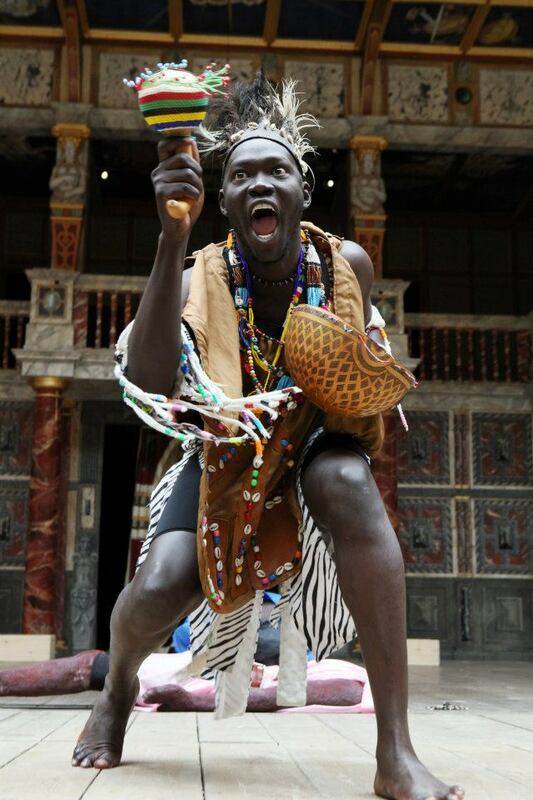 To ensure that the non-Juba speakers were not left out, the cast slipped into English at key moments, anchoring the plot for its London audience, and also maybe indicating how one language is often a tapestry of many. Juba Arabic, I imagine, must also contain many words and phrases from indigenous languages. This production set out to make this an African story in form as well as setting. Interspersed and framed with songs and dances, the ‘play’ itself opened with the cast taking turns to summarise the story for the audience, suggesting an oral story-telling tradition. The play’s ancestors returning from the dead to call on the gods to intervene in the lives of their descendents also played to Western preconceptions (or misconceptions) about African religion and beliefs, because of course, the ancestors came from Shakespeare’s text and the gods were Classical (Roman). 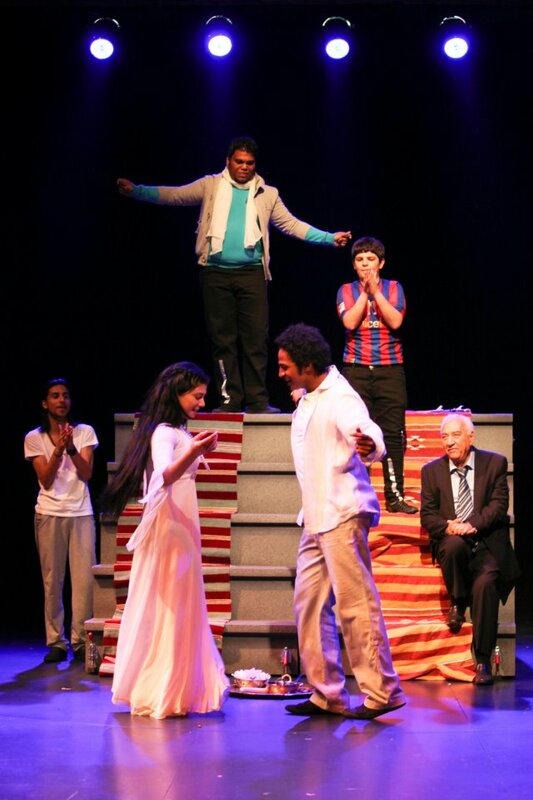 However, the play’s translator felt this also found equivalence in Sudanese tradition. If you read the company’s blog, you can follow the process of how this troupe of global, multi-lingual, multi-cultural and mostly young people took sophisticated ownership of what some may see as a post-colonial project. Ashtar resisted having words put into their mouths by the festival organisers, quite literally. Following the linguistic vision of the Globe to Globe project, ’37 Plays in 37 Languages’, they had been asked to translate the play into Palestinian Arabic. ‘We tried,’ said Shbib, who also played the Queen, ‘but it didn’t work. You can’t have Richard II sounding like he’s on the bus!’ Because it’s a play in which imagery and rhetoric is so central, they decided to work from an existing translation in classical Arabic, by an Egyptian. It was then modernised by a Palestinian poet, and reworked to give it dramatic and psychological force by the actors themselves and their Irish co-director. This added a certain frisson to Richard’s campaign to Ireland, I can assure you. But the Festival still promoted it as Palestinian Arabic on the flyer. Whatever type of Arabic they were speaking, when Richard, played by the mesmeric Sami Metwasi sat on the edge of the stage and lamented the death of kings, I felt the tears spill down my face. The woman on the other side of him was clearly struggling to hold back hers, and Richard’s eyes filled to the brim. This was nonetheless a simple, stunning, shocking production. 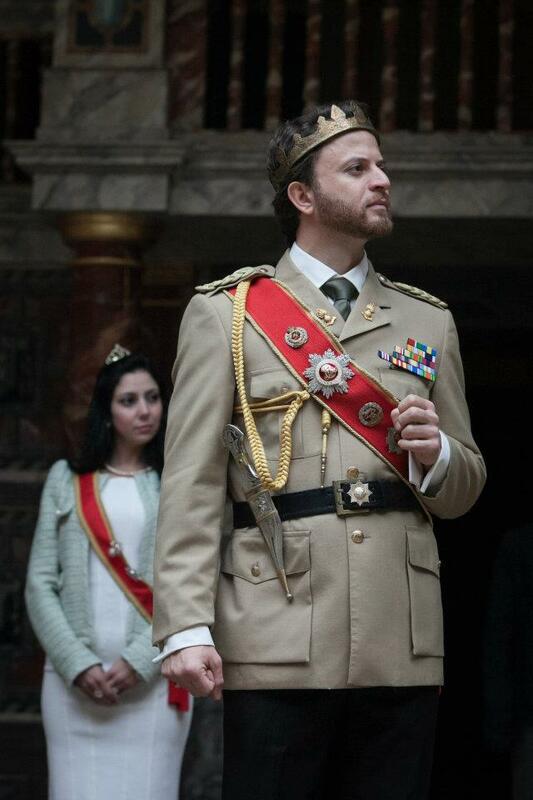 Appropriated into a contemporary Baghdad setting, the production used Shakespeare’s play as a frame in which to hang its own story, a tragedy of modern Iraq. Again there appeared to be a mismatch between what the RSC envisioned and what the Iraqi Company chose to do. The World Shakespeare Festival publicity and the local news touted it as a love story set in the Sunni/Shia divide, but there was no reference to this in the programme or the surtitles, suggesting that director Monadhil Daood’s reconfiguring was more nuanced. Montague and Capulet were blood brothers, sharing the same father but mothered by different wives. Fuelled by jealousy over family hierarchies and parental favouritism, the family’s dislocation was exacerbated by the war and exploited by the local muhajadeen, Paris. Key characters, scenes, and images remained: Juliet’s nurse flirting with the Montague boys, Romeo and Juliet clinging to each other on a balcony, but many of the details were fundamentally different. The lovers embraced life and looked to find a way to live a future. The only suicide was that of the bomber that killed them. Again, in the process of translation, the creative team searched to find equivalences. How could Mercutio’s tale of Queen Mab speak to an Arab audience? Whereas Bas Lurhmann made sense of this difficult and now alien speech through the image of a small hallucinogenic pill on the tip of cross-dressing, party-going Mercutio’s finger, Daood turned to an old folktale about a beetle, a rat and a radish seller, and the pointless destruction of war.